If you're a Mobile DJ, Retailer, PAT Tester, Photobooth Operator or Supplier of Equipment & / or Services to any of these, we're here to help. It's the main reason people join us, although we do have many other Member Benefits below. Our £10m PLI ensures you have the best PLI cover available. We have had a few claims and they've all been settled to the satisfaction of all parties. There's no catch, it's just Public Liability Insurance that's cheaper to get than anywhere else! This is included free of charge to paid Members. ELI covers anyone who works for you against injury, whether they are full or part time, paid or unpaid. many organisations don't give you this, but we think it's important, just in case someone helping you has an accident while assisting you, and then decides to claim compensation for their injury. By having MDJN ELI you don't need to worry about that! This aspect of the free Policy you get as a paid Member is what covers failures in your equipment which causes an accident or incident leading to a claim. 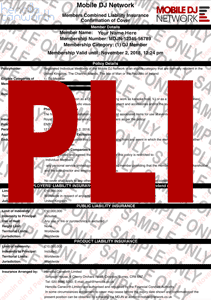 Sometimes you may need PLI in a hurry, whether you've forgotten to renew or this is your first time getting it. Imagine Turing up at a venue and before you're even allowed to set up, the Manager insist on seeing your PLI, scary! Well with MDJN PLI it's a very quick application and payment which in total should take no more than 3 minutes, your policy is then instantly available online. Then just login to your Dashboard and download your policy or send the venue a link. You could even show the Manager on your phone, it's that easy! As a free Member Benefit, MDJN will host your website for you, up to 500mb (plenty for the vast majority of sites). We can install Wordpress or Joomla for you, or you can code and design it from scratch. Unlike some hosting platforms, we don't hide your site behind ours, it stands on it's own and we don't sneak adverts for us or anyone else into it. All we ask is that it should contain subject matter about your business and does not contain illegal or offensive material or link to that kind of thing. We recommend you keep regular local backups of the website and emails. Our responsibility ends at hosting your website, we do not assist with creating or managing the content, back ups etc. We often have Member Only deals and discounts from your favourite Retailers and Suppliers, these will be published in our Monthly Newsletters as well as here. When you log in, there will be a link to Member Only deals and offers in your Dashboard. This gives you the code you need to get the discount or offer. Looking to get a little more work? There are many listings sites on the web, some good and some total rip offs. Most will hide your details from the public, and when they get a client enquiry they will pass it out to dozens or even hundreds of your competitors. Often meaning the person submitting the lowest quote gets the gig. This might work for you, or you may prefer to be able to present your profile in a stylish way, to targeted clients and get enquiries come direct to you... This is what we do! When you next go to your Dashboard, have a look at your Membership. When you edit it you'll see lots of fields you can complete in order to tell clients more about what you offer. You can upload your logo, pictures, write a full description, tick boxes to show what options your offer, clients can then search for Members near them or their venue and filter on what's important to them. We present your details (if you added a description longer than 150 characters and uploaded at least one picture) on websites specific to your type of business and your style, so the clients going there are looking for your type of business already. In addition to the free listings we give you as part of your Membership, you can also target clients by creating another Listing at another post code. You may have a regular venue or area you like, which is nowhere near your base. Just create a new Listing and enter a postcode of your choice, your Listing will then be displayed to clients searching in that area. This means you can also target specific markets with multiple Listings, whether that's Weddings, Kids parties etc. A Listing costs much less than full Membership and doesn't include all our benefits, but could be a real sales asset for your business at minimal cost!